BACKGROUND: Professor Robert L. Coleman M.D., FACOG, FACS discusses the implications of data from the Phase 3 ARIEL3 trial of the novel PARP inhibitor rucaparib as maintenance therapy in patients with platinum-sensitive ovarian cancer. 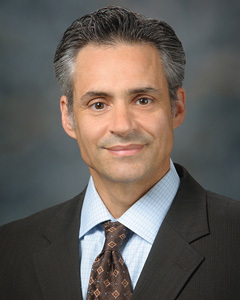 Professor Coleman is the Vice Chair of Clinical Research in the Department of Gynecologic Oncology and Reproductive Medicine at The University of Texas MD Anderson Cancer Center in Houston and the U.S. Principal investigator for the ARIEL3 study. Background: For decades, it has been appreciated, clinically, that ovarian cancer patients with a strong family history of ovarian and/or breast cancer had a better prognosis than those without these characteristics. Subsequent work, greatly enhanced by data from The Cancer Genome Atlas (TCGA) project, demonstrated that this observation was largely due to vulnerabilities within the tumor related to an impairment in the repair of extrinsic DNA damage (e.g., from chemotherapy or radiation). Patients whose tumors harbor impaired DNA damage response (DDR) generally have better outcomes, with higher response rates to these modalities compared to those without because the inflicted damage is inefficiently repaired, causing a propensity toward cancer cell death in those afflicted cells. Key regulators of this process are BRCA1/2 genes, which are carried in the germline of approximately 12-17% of ovarian cancer patients. However, analyses from the TCGA and others have documented that about 5-8% of ovarian cancer patients have a BRCA1 or BRCA2 mutation in the tumor without it being in the germline; further, a number of other genes regulating the DDR process (e.g. RAD51, RAD51C, PALB2, etc) can additionally or independently be mutated in the tumor, increasing the catchment opportunity for therapy targeted to this vulnerability to almost half of all ovarian cancer patients. Mechanism of Action: Currently, the most “targeted” therapies to this DDR defect are the PARP inhibitors. Key to understanding how and why these agents might work under these circumstances is the concept of “synthetic lethality”, or the condition where two non-lethal events when present lead to lethal consequences in the cell. In the case of PARP inhibition, interruption of this base excision repair protein (PARP) leads to a statistically greater probability of double strand DNA breaks where high fidelity DDR pathways are needed for cell survival. The dominant regulators of this are BRCA1 and BRCA2; if they are dysfunctional via mutation, then damage can’t be repaired adequately or efficiently, which then leads to cell death. ARIEL3: Clinical proof-of-principle for the PARPi’s in this context has been known for some time, but only recently have the randomized phase III trials demonstrated the true impact of this intervention. Most recently, ARIEL3, a randomized, double-blinded, placebo-controlled, phase III trial was completed and its topline results released. Rucaparib, already approved by the U.S. FDA as monotherapy for the treatment of patients with deleterious BRCA mutation (germline and/or somatic) associated advanced ovarian who have been treated with 2 or more prior chemotherapies, was compared to placebo in 564 women with platinum-sensitive, high-grade ovarian, fallopian tube or primary peritoneal cancer who had achieved a response to induction platinum-based therapy. Subjects were randomized 2:1 to rucaparib. The primary efficacy analysis evaluated three prospectively defined molecular subgroups on a step down manner: 1) tissue BRCA-mutant (inclusive of germline and somatic BRCA mutation); 2) homologous recombination deficiency (HRD-high), which included the first cohort plus those with documented “injury” in the genome; 3) all patients (intent-to-treat, ITT) population. The primary endpoint was progression-free survival (PFS) and was assessed by the investigator. A secondary analysis of PFS using a blinded independent central review (BICR) was also performed. ARIEL3 Results: Efficacy: In all three analytical groups, rucaparib out-performed placebo on PFS. The most striking was among the 196 BRCA-mt patients where the hazard for progression was reduced by 77% (HR 0.23, P<0.0001; 80% by BICR) and reflecting an increase in the median PFS from 5.4 months (placebo) to 16.6 months (rucaparib). In the HRD-high cohort (inclusive of BRCA-mutation) the effect was similarly strong (HR: 0.32, P<0.0001), which carried over into the ITT population, which included 210 additional patients considered as wild-type (no BRCA mutation, LOH-low). The reduction in the hazard for disease progression was 64% (HR: 0.36, P<0.0001) and was associated with a doubling of PFS at the median, from 5.4 months (placebo) to 10.8 months (rucaparib). The overall treatment impact assessed by BICR was similar in each of these categories. Exploratory PFS analyses of the independent non-BRCA mutation subgroups also showed robust activity of rucaparib. Nearly two-thirds of patients entering the trial had partial response to their prior platinum-based therapy. Of them, 37% had measurable disease at the time of enrollment and were therefore evaluable for response. The confirmed overall response rate by investigator-assessed RECISTv1.1 in tumor BRCA positive patients treated with rucaparib was 38% (15/40), of these, 18% (7/40) were complete responses. This was consistent with observations already documented in the ARIEL2 study. Safety: Fortunately, no new safety signals were observed in this large cohort of exposed patients. As was reported in the FDA label for rucaparib, the most common treatment-emergent severe adverse events (grade 3/4) in ARIEL3 were anemia (19%), ALT/AST increase (11%), asthenia/fatigue (7%), neutropenia (7%) and thrombocytopenia (5%). Treatment discontinuation for adverse events was 14% compared to <2.6% in the placebo cohort and the rate of MDS/AML was <1% (3/372) vs none in the placebo cohort. Clinical Impact: The impressive data from this trial confirms not only our clinical observations of the efficacy of PARPi’s in the clinic but also adds to the structured analyses of their efficacy in clinical trials. Three randomized clinical trials of similar design (NOVA [niraparib], SOLO2 [olaparib] and ARIEL3) have demonstrated consistent and complementary efficacy data in the BRCA-mutation population and 2 (NOVA and ARIEL3) in extended populations of HRD and all-comers. Somewhat differential between the agents are the adverse event profile; however, each of these agents requires attention/monitoring in the clinic to ensure that patients can be compliant and achieve the optimal outcome. Several additional trials are working to extend these favorable results through novel combinations and others are directly comparing to active standard of care regimens. In all, future analyses of each of these trials will shape the clinical landscape of "who", “when” and “what” of PARPi treatment will be best. Dr. Coleman served as US Study Lead PI for ARIEL3 and has received research support from Clovis to conduct this trial and ARIEL2. Robert L. Coleman, MD. Rucaparib Maintenance Therapy Improves PFS in Platinum-sensitive Ovarian Cancer - The ARIEL3 Trial. Doctors Lounge. Available at: https://www.doctorslounge.com/index.php/articles/page/74998. Accessed April 20 2019.